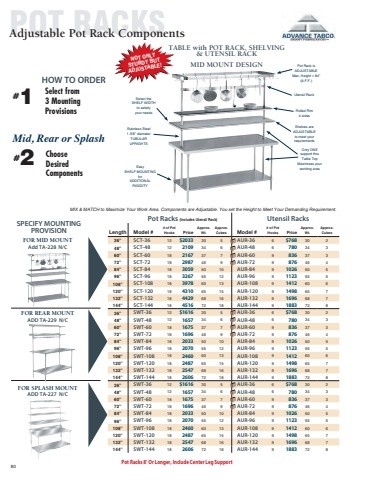 DISHTABLES  Cle an Di shta ble s stRaight clean dishtables Spec-Line S30 Series Standard S70 Series Super Saver S60 Series Model # Price   Nominal Size Length 2 Ft. 23” 3 Ft. 35” 4 Ft. 47” 5 Ft. 59” 6 Ft. 71” 7 Ft. 83” 8 Ft. 95” 9 Ft. 107” 10 Ft. 119” 12 Ft. 143” Model # Price Model # Price                                     80 30" 30" DTC-S30-144LorR Optional Undershelf 3665 DTC-S70-144LorR L 3345 DTC-S60-144LorR 3151 35 lbs. 12 45 lbs. 12 60 lbs. 17 70 lbs. 19 85 lbs. 23 100 lbs. 27 110 lbs. 31 225 lbs. 45 250 lbs. 50 270 lbs. 60 14 Ga. DTC-S30-24LorR $1590 DTC-S30-48LorR 2019 16 Ga. DTC-S70-24LorR $1504 DTC-S70-48LorR 1879 16 Ga. w/ Galvanized Legs DTC-S60-24LorR $1369 DTC-S60-48LorR 1745 DTC-S60-96LorR 2181 ! ATTENTION: See Dish Machine Information on Pg. 77 to ensure proper compatibility  Approx. Weight Approx. Cu. Ft.           DTC-S30-36LorR 1929         DTC-S30-60LorR 2151         DTC-S30-108LorR 3207          14 Ga. DTC-S70-36LorR 1726 DTC-S70-60LorR 1990 DTC-S70-108LorR 2835 16 Ga. DTC-S60-36LorR 1591    DTC-S60-60LorR 1855         DTC-S30-72LorR 2270 DTC-S70-72LorR 2087 DTC-S60-72LorR 1952         DTC-S30-84LorR 2755 DTC-S70-84LorR 2318 DTC-S60-84LorR 2129        DTC-S30-96LorR 2884 DTC-S70-96LorR 2514 DTC-S60-108LorR 2674         DTC-S30-120LorR 3333 DTC-S70-120LorR 3055 DTC-S60-120LorR 2869     6" L          2" 30" 6" 21 3/8" 1 1/2" 21 3/8" 1 1/2" 2" 30"                                       Spec-Line K30 Series Model # Price Standard K70 Series Super Saver K60 Series Model # Price LEFT CLEAN TABLE RIGHT CLEAN TABLE coRneR clean dishtables   Nominal Size Length 4 Ft. 47” 5 Ft. 59” 6 Ft. 71” 7 Ft. 83” 8 Ft. 95” 9 Ft. 107” 10 Ft. 119” 12 Ft. 143” Model # Price 16 Ga. w/ Galvanized Legs Approx. Weight Approx. Cu. Ft.           DTC-K30-48LorR $4259 DTC-K70-48LorR $3959 DTC-K60-48LorR $3716          DTC-K30-60LorR 4380 DTC-K70-60LorR 4069 DTC-K60-60LorR 3813          DTC-K30-72LorR 4569 DTC-K70-72LorR 4366 DTC-K60-72LorR 3983          DTC-K30-84LorR 4784 DTC-K70-84LorR 4534 DTC-K60-84LorR 4154          DTC-K30-96LorR 4834 DTC-K70-96LorR 4590 DTC-K60-96LorR 4206          DTC-K30-108LorR 5993 DTC-K70-108LorR 5670 DTC-K60-108LorR 5345          DTC-K30-120LorR 6279 DTC-K70-120LorR 5931 DTC-K60-120LorR 5549          DTC-K30-144LorR 6906 DTC-K70-144LorR 6486 DTC-K60-144LorR 6105 2" 59" 105 lbs. 29 115 lbs. 37 125 lbs. 44 138 lbs. 51 157 lbs. 58 330 lbs. 83 360 lbs. 92 380 lbs. 110 L   59" 2" 30" 21-3/8"                                            30" 21-3/8"              L 1-1/2" 1-1/2"   LEFT CORNER CLEAN TABLE RIGHT CORNER CLEAN TABLE    2" 2"